Front photo: That sure looks like the Oakland Coliseum behind him! Along with #11 Mark Hutton, this is the second one in the set that really looks like it is from a big league game. Ties to my personal collections: Was originally a Blue Jay - shipped west in the trade that brought Rickey Henderson to Toronto in 1993 for their post season run. It was a perfect example of a Rent-A-Player, as Rickey was back in Oakland for 1994. 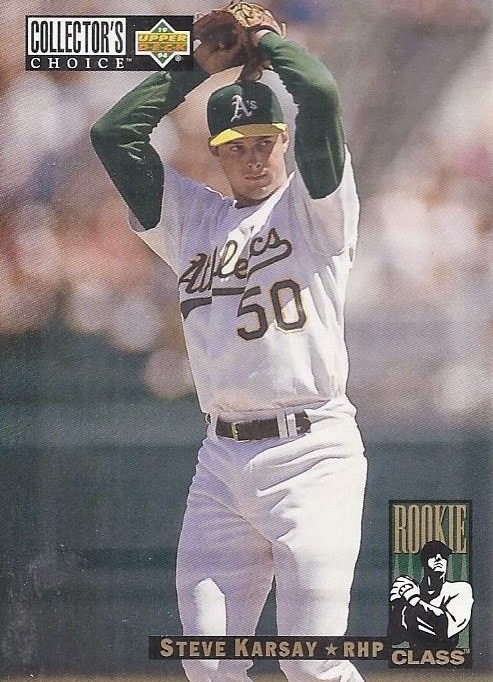 He was a very hyped player for the Jays, and did get some draft pick/prospect cards as a Blue Jay, but he never played for the big club, and made his major league debut with Oakland. Wiki-facts: Was part of a three-pitcher effort to throw a perfect game in 2005 while playing for Frisco in the Texas League. The other pitchers who were a part of this, Scott Feldman and A.J. Murray, also spent time in the big leagues. 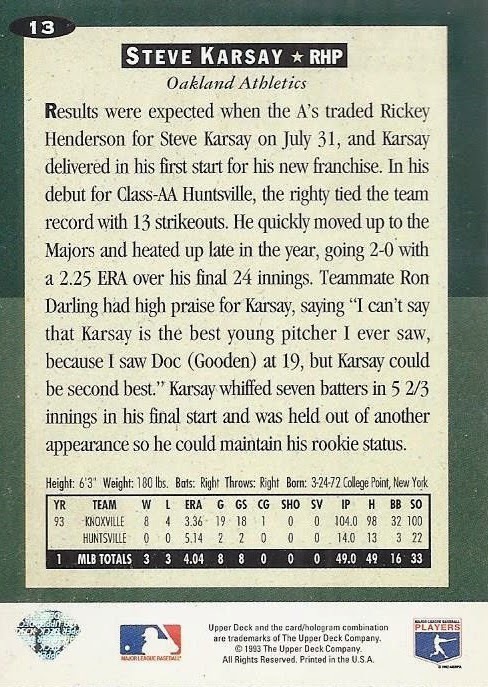 Karsay is now a pitching coach in the Indians system. How was his strike-shortened 1994? : 4 games, all starts, and he finished with a 1-1 record. Birthday boy: March 24, 1972 is also the birthdate of former big league reliever Jose Cabrera. Also born on that date was former Ottawa Senator Bruce Gardiner, another tie to one of my PCs. Next up: #14 - Marc Newfield.